Flavor Text: He heard his muse first, beautiful and grotesque, singing on the shores of Lake Hali. The Loyal makes it harder to do, but using this after You Know Too Much seems like it could ruin anyone's day. A Madness that can only be recurred with Patron at Night. If you could chose from the whole hand of the opponent, the effectiveness of tempo gain or threat management would be much more certain. With the Loyal, this falls to a 2/5. I like this card. It has the same denial potential Apeiraphobia once had before the errata weakened it. Once your opponent is top-decking, recurring and playing this card after each of his draw phases could really hamstring him. Combined with Guardians of the Gate, and your opponent basically doesn't get to draw cards anymore. You're right. 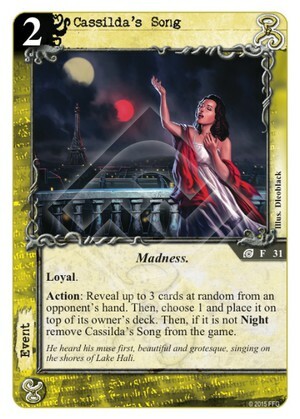 I have a Yog/Hastur deck that features Doctor Lomboso and Cassilda's Song. Haven't had a chance to test out that combo in a game yet, but the theory seems sound.